Lassen Volcanic National Park is located in Northern California, about 250 miles north of San Francisco. Since Lassen, Yosemite, and Lake Tahoe are all roughly 4-5 hours away from the San Francisco Bay Area, most people choose to go to Yosemite or Tahoe, leaving Lassen relatively crowd-free, even in the middle of the summer season. Which is a pity, because Lassen has as much to offer and it's one of the most beautiful parks in California. Second, there are a lot of things to do at Lassen. Hiking is of course the big attraction here; there are trails for every level ranging from very easy to difficult ones that require overnight stays. Two popular trails are Bumpass Hell and the hike to the top of the Lassen Peak. The Bumpass Hell trail (named after an unfortunate gentleman named Bumpass who lost a leg there) is about 3.5 miles round trip and can be done in 2 hours. Once you reach the end you get to see what makes Lassen such a great place. There are some great photo opportunities of the steaming fumaroles and bubbling streams. This hike is popular, but still it is not crowded. The hike to Lassen Peak is a little mode difficult (more elevation gain), it's longer and evidently takes longer to accomplish. Located in the northeast corner of the park you can also visit a cinder cone. It's rather off the beaten path but once you get there you'll discover an interesting landcape, worthy of the trip. 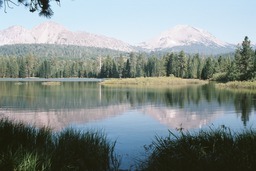 You can also fish and boat at Lassen. Third, for a national park, Lassen it's not crowded at all. Both times I went to Lassen for the Fourth of July weekend and both times there were very few visitors. We passed a few people on the trail, but not many. It was quiet and peaceful. I went to Yosemite for Memorial Day and it was so crowded one could barely breathe. The only drawback to Lassen is that the open season is very short. The main road through the park is closed during the winter, as are the campgrounds. I've read that parts of the park are open for cross-country skiing during the winter months, but I didn't try that yet.